We had the pleasure of honoring our 2017 scholarship winners at our annual Second Chance Luncheon this past week. Both students received a $1,000 scholarship with the help of Staples and Sherry Lambson of South Milhausen, P.A. We wish them both the very best as they head off to college this fall and begin an exciting new chapter in their lives! Dr. Jeffery Shebovsky and Dr. Eric Feiter generously donated $3000.00 dollars to the Second Chance of Florida Foundation, this donations will help three young adults pursue their education and achieve a better future. This is not something uncommon for Dr. Shebovsky and Dr. Feiter, since their whole approach towards their company is helping their patients live better, healthier and pain free lives. The Orlando Chiropractor’s Philosophy towards medicine is quite nontraditional, they do not want to just fix the current problem like a traditional doctor. They believe that living healthy with reduce the risk of illness in pain in the future. It is also important that their patients are “cozy and familiar, offering a rediscovery of health and wellness that had been previously known but long lost”. Dr. Shebovsky, Dr. Feiter and their team are dedicated to helping you obtain optimal health by designing a program specifically tailored to your needs. They take pride in their work and have received quite a bit of recognition for their outstanding work , professional sports teams even come to Dr. Shebovsky for their personal care. All of their clients have glowing reviews of their work and their hospitality. They are truly the only choice when looking for a Chiropractor or a Wellness center in the Orlando area. Evans High School held their Senior Awards this week. 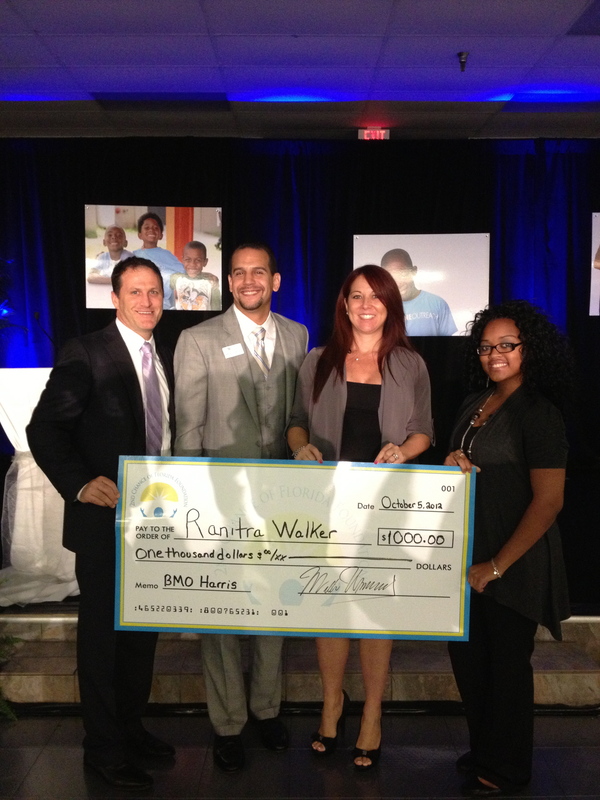 Second Chance of Florida Foundation with BMO Harris Bank awarded Ranitra Walker with a $1,000.00 scholarship. We are also excited to announce that Ranitra is in the Top 25 Academic Seniors. We are so proud!! We Awarded Our First Scholarship!!! Thank You BMO Harris Bank! ORLANDO, FL October 10, 2012, – With the high rate of Orlando residents living on welfare and in poverty, Orlando criminal lawyer William Umansky recognized the need to help his community. He founded Second Chance of Florida Foundation in 2011 to assist students who are doing well in school, but don’t have the financial support to head to college.. The foundation raises money for college tuition and book scholarships for the benefit of students who display academic excellence, despite one of their parents being behind bars in jail or having suffered other significant hardships in their life. 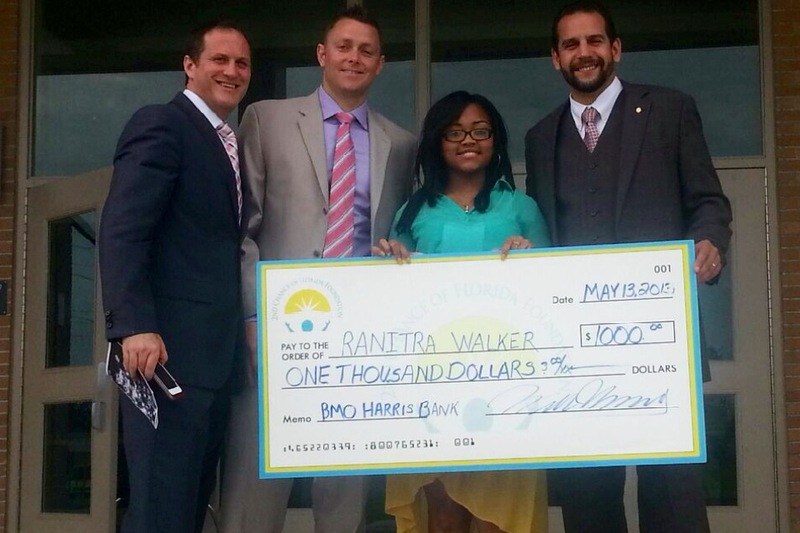 Second Chance of Florida Foundation, with help from supporters at BMO Harris Bank recently awarded the first scholarship to Ranitra Walker, who currently attends Evans High School. The scholarship is called the BMO Harris Bank Second Chance Scholarship after a generous donation by the bank. Ranitra is a promising young student who sets a shining example for future students the Foundation hopes to serve. Scholarship applications are in! We have received several applications from OCPS students and our board members are currently in the process of reviewing applications. We are excited to finally be able to award eligible students and will be announcing recipients very soon. The Second Chance Foundation will be holding an award banquet on October 5 at the Frontline Outreach church to present scholarships to those students! Join Second Chance on Friday, September 14 for J. Hilburn’s second annual suit drive! This event benefits Bridges of America, an organization that assists men in re-entering the community and workforce by providing them with gently used business attire. These suits help the recipients integrate back into the workforce and attain much-needed jobs by providing them with a professional appearance. Donations will be rewarded with a free haircut voucher, courtesy of Superman’s professional grooming, as well as a $20 J. Hilburn gift card. 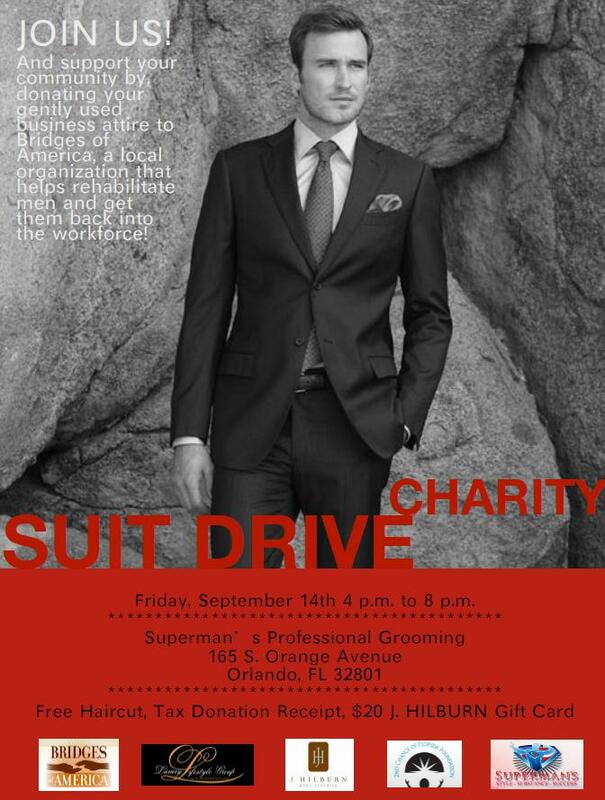 Help change a person’s life by contributing to this great cause and donating your gently used suits! The event will be held at Superman’s Professional Grooming shop, located at 165 S. Orange Ave., Orlando FL 32801 from 4 – 8 p.m. We hope to see you there! We are excited to announce a new partnership with POPS Inc. – the Professional Opportunities Program for Students. POPS is a great organization that prepares students for the future by reducing at-risk factors and ensuring students’ success in finishing high school and planning for higher education as well as a meaningful career path. We here at Second Chance feel that the goals of POPS closely align with ours and we are thrilled to cultivate this new union. Check back soon for details about upcoming events! Read more about POPS on their website at www.popsinc.org.